Marian Percy was honored by the Board of El Paso County Commissioners at its regular meeting Thursday, May 31, with an official Proclamation, expressing thanks for her 21 years in the Department of Human Services. He added that Percy is representative of the Department of Human Services. “Your involvement demonstrates how much you care about policy and making sure kids are taken care of in El Paso County, and the entire state of Colorado,” he said. 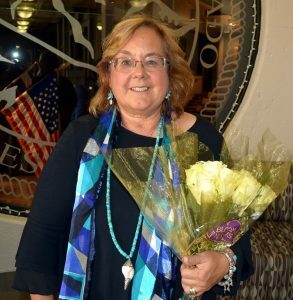 Marian Percy retired from El Paso County Department of Human Services in May 2018. Percy began her El Paso County career in 1997, and served as an intern on the Intensive Family Intervention Team in 1996. She held multiple positions during her time at DHS in the intake and ongoing areas, including caseworker, supervisor, and manager, as well as nine years on the after-hours Child Abuse Hotline pager staff. She was promoted to Child Welfare Intake Manager in 2007, still one of the most challenging jobs in the agency, and in 2011 was named Deputy Director of Children Youth and Family Services, overseeing seven managers who managed all practice areas including more than 225 staff responsible for over 900 child welfare cases. DHS staff, representatives of community partners, and others praised Percy’s work, dedication, compassion and mentoring skills. Percy has been committed to the Adolescent Program areas including the development of an Adolescent Workgroup and the Fostering Adulthood Program. She worked extensively to reduce the number of children placed in congregate care through the development of two kinship units, the Families Matter initiative, and her work with the Annie E. Casey Child Welfare Strategy Group. “Thank you very much for what you have done for the community, and what you will continue to do,” said Commissioner Stan VanderWerf. Percy shared thanks of her own, to her mentors, community partners, as well as County leadership and DHS staff. “I know our staff are in good hands with a strong team of managers who work incredibly hard and who will continue our commitment to families,” Percy said.